I had reviewed another application by tbox apps in the past (Odd One Out Pack), so I was excited when they were interested in participating in this giveaway. In addition, having recently reviewed another minimal pair application, it was great to see what all was out there in terms of minimal pair applications and how they compare. 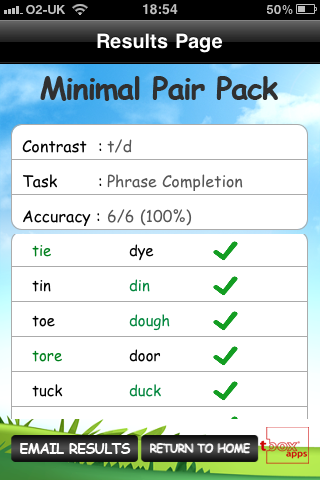 Minimal Pair Pack is easy to use, clean, and includes two different minimal pair activities in one application! To learn more about this minimal pair application and for a giveaway of the application, continue reading! The main page allows the user to choose between Discrimination or Phrase Completion activities. Sound can be turned on/off by pressing the microphone button. Settings can be accessed by pressing the gear button. You can choose via a scroll wheel which sound will play for a correct and incorrect answer. Press the microphone to hear the sound. Select Voice - Choose between a US or UK English voice by pressing on the circle next to the text. 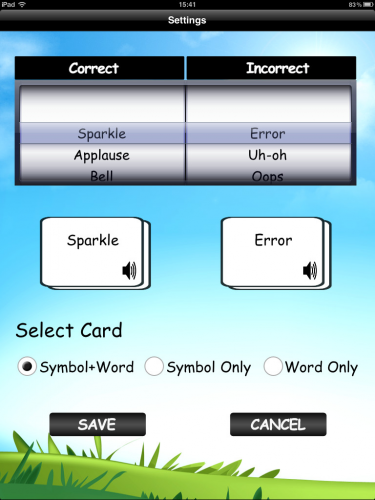 Select Card - Select the information to appear on a card between the symbol and the word, symbol only, and the word only. First choose between Discrimination and Phrase Completion activities. Then, choose the phonemes to be contrasted via the scroll wheels and press "Start". Discrimination - Press "Play" to hear the word. Then, select the associated card and a green check mark will appear over the correct answer and a red "x" will appear over the incorrect answer. A sound will play as well that you have chosen on the settings page. If the incorrect answer is chosen, the application will also ask if the user would like to try again. Phrase Completion - Press "Play" to hear the phrase with the last word missing. Then, select the word that fits in the blank at the end of the phrase out of the two choices.A green check mark will appear over the correct answer and a red "x" will appear over the incorrect answer. A sound will play as well that you have chosen on the settings page. If the incorrect answer is chosen, the application will also ask if the user would like to try again. A progress bar will appear at the top as well. Once you have completed the set of cards, the application will state "Congratulations! You have completed the task!" Then, a results page will appear with the contrast at the top, task, accuracy, and specific word pairs that were correct/incorrect. You can then choose to e-mail results or return home. There are images associated with the words so that the student can more easily discriminate between the two. Having two different activities to use for minimal pairs is great for students at different levels of mastery. Being able to adjust the settings between US and UK voices as well as choose the types of textual/visual cues is great for students at different levels of mastery. Having the words/phrases narrated aloud is perfect for auditory discrimination and helpful for children who have difficulty reading. Some of the phoneme pairs are not considered "minimal" pairs. 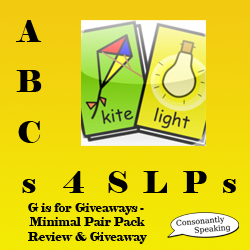 Minimal pairs must be different by only one phonological feature (articulatory placement, voice, or manner). For example, /p/ and /g/ are not considered minimal pairs because they differ by two different features (voice and placement). In addition, there were a couple errors in the application such as "pork" and "chalk" not being minimal pairs as the words are not pairs in US English. When two phonemes that are the same are chosen, the application notifies the user that "there are no words in the contrast you have selected"; so it would be appropriate if the application did this for other pairs as well that are not minimal pairs. When the US Voice and UK Voice are switched, the spellings of the words are not always switched. For instance, when I chose the US Voice, the UK spelling of check ("cheque") was used. It would be more appropriate if when the voices are switched that the spellings would switch as well. 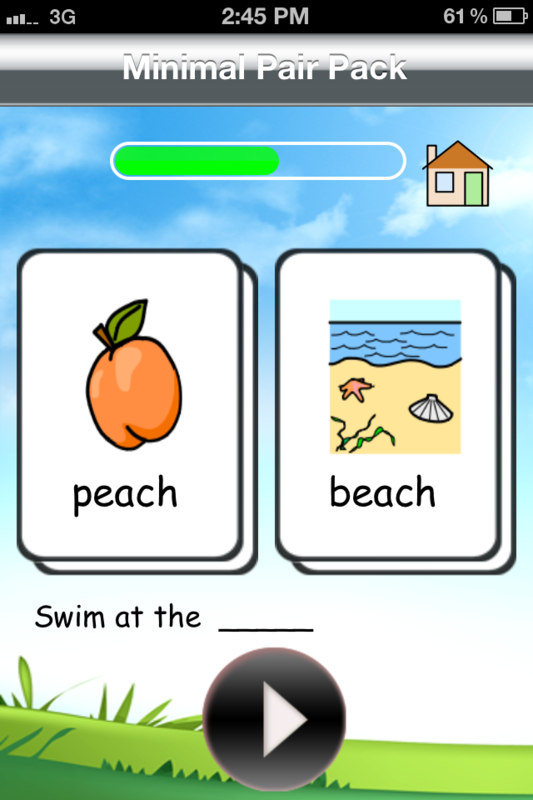 It would be great to hear the contrast between the two words prior to choosing the correct answer or in a separate activity. Phonological Disorders - Use the minimal pair technique to help students distinguish between sounds and correctly state sounds. Auditory Bombardment - Press the "Play" button to hear the words stated aloud. 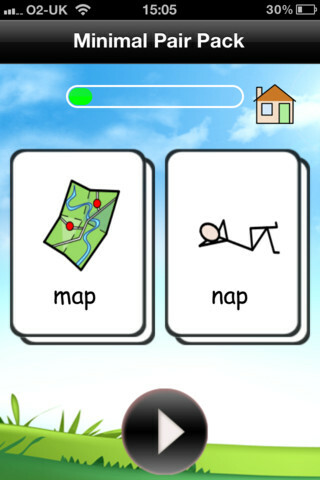 Articulation - Choose the articulation sounds that the student is working on for words associated with the sounds to play on the application and have the student practice his or her sounds. Minimal Pair Pack is available for the iPod Touch, iPhone, and iPad for $29.99!